The club was opened on 20th June 1988 with some 150 titleholders (not all bowlers) and just two annual members. The club has gone from strength to strength over the last 25 years and currently has a bowling membership of 200, comprising of titleholders, annual and temporary members. 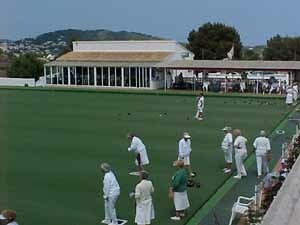 The club have 4 teams playing in the Costa Blanca Leagues, with it’s Rinks team playing both north and south of Alicante and is known as the BBC. The three other teams compete in the “Northern League” playing other clubs north of Alicante, and go by the names of the Lions, (who were the League Champions for 2007/8//10/11/12 & 13) the Tigers and the Jaguars, known also as the “big cats”. We have 8 rinks which are all synthetic surfaces and the club is open 7 days a week for the members to practice their skills and play in a variety of competitions both “in house” and open events. There are three sessions devoted to “club days”, Tuesday mornings, Friday mornings and Sunday mornings, which attract many of the club members. The club house is the centre of activity before and after matches, where members can obtain refreshments and the social side of the club meets to enjoy their many functions. 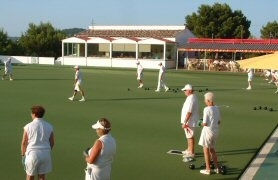 To contact the club by telephone – 96 649 3151.
or a FREE half-hour Bowling Session with our Instructors. Coaching ethos at Benitachell is one of encouragement and constructive advice, and is carried out by well qualified and experienced personnel with the theme of friendliness and encouragement, with a certificate presented on successful completion. Lawn Bowls is a wonderful social game. Enjoy new found skills and develop them. It’s up to you how far you go from being a social bowler; to competitive or to international level. We cater for the complete range of bowlers at Benitachell. From Teulada follow the CV-740 all the way to Benitachell turning right into Padre Placido and continue through the traffic lights passing Mas y Mas on your right and continue past the petrol stations on your left. 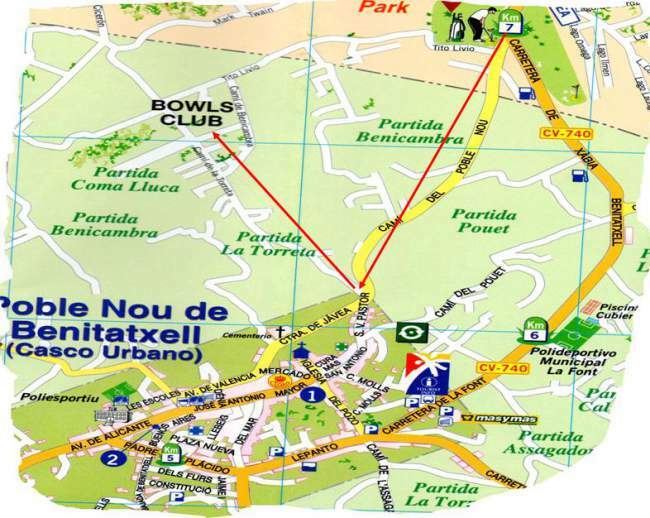 Just after the second petrol station you will need to turn left into Cami del Poble Nou and go back on yourself, turning sharp right at the top of the hill just after the “sleeping policemen” into Camino de la Torreta. The Bowls Club is on the right-hand side towards the bottom. This stylish, modern bed and breakfast is set 5 km from Moraira Beach. With stylish décor, each room features a private furnished patio and kitchenette including refrigerator and mini bar. There is a flat-screen TV and the bathroom comes with a bathtub. Towels and bed linen are provided. Finca Klara offers extra facilities such as a spa and wellness centre with sauna and hot tub, for an extra cost. There is an extensive garden and furnished terrace. Jávea Golf Course is 2 km away, while Cova de l’Aigua National Park is 15 minutes’ drive. Jávea is 10 minutes by car and Denia is 15 km away. Alicante is 90 km from the property.